There is no need to be afraid of yeast. Yeast can be your friend. Bread is so expensive in the stores, plus who can even pronounce all of those preservatives? Who wants to eat all of those preservatives?? This recipe is easy and you will not believe how delicious it is with only a few ingredients that you may have in your pantry. Flip loaf out on to a cooling rack, let cool completely before cutting. Nothing smells better than a loaf of bread baking in your oven! This bread makes the most amazing toast, if it lasts that long!! 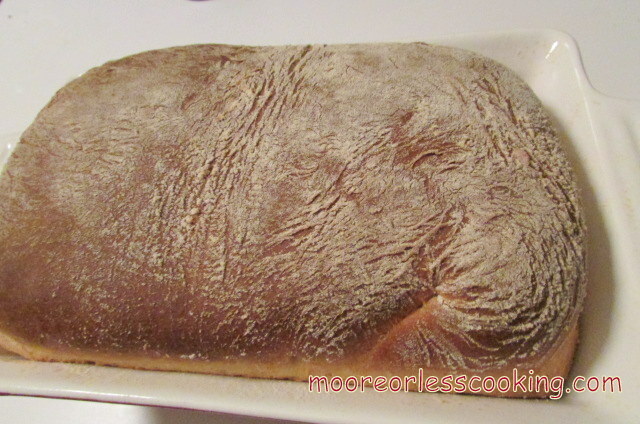 This is an easy and too delicious recipe for home-made baked bread, don't be afraid of yeast! In a bowl, stir together warm water and yeast. Stir until there aren't any lumps. Melt the butter in the microwave, then add it, the milk, the sugar, and the salt to the yeast liquid and stir. Add two cups of flour to the mix – (save the rest for later.) Start stirring, and then add the flour about ¼ cup at a time every minute or so. It will stick to the spoon. Keep stirring and adding flour until the dough is still slightly sticky, but it doesn’t stick to your hands in any significant way. Also, it should largely clean the sides of the bowl. Rub flour on hands and large cutting board. Take the dough ball out of the bowl, slap it down on the board, and start beating on it. Just take the dough, punch it flat, then fold it back up into a ball again, and repeat several times. Take it in your hands and squeeze and twist it. When the ten minutes are up, shape it into a ball,then either clean up the bowl you were using before or get out another bowl. Either coat the inside lightly with nonstick cooking spray, then put the ball of dough inside the bowl. Put a cloth over the bowl and sit it somewhere fairly warm for an hour. I used the warming zone on top of my stove, set it as low as it will go. Dough should be roughly double the size that it was before..
Punch the dough down (three or four good whacks will cause it to shrink back down to normal), then lay the dough out on the floured area and spread it out in a rectangle shape, with one side being roughly the length of the bread pan and the other side being about a bread pan and a half long. You may need to put a bit more flour on it and on the board to prevent sticking. Then, roll it up! The roll should be roughly the same size as the bread pan. Cover that loaf up with the towel, put it back where it was before, and wait another hour. . Put that loaf in the oven at 400 degrees F for thirty minutes. When bread is done, pull it out and immediately remove it from the pan to cool on a bakers rack. Let cool completely before slicing. Thank you Sally! How to get your stress out! I feel like I can smell the bread from here. There’s nothing like freshly baked bread. Thank you Janette! 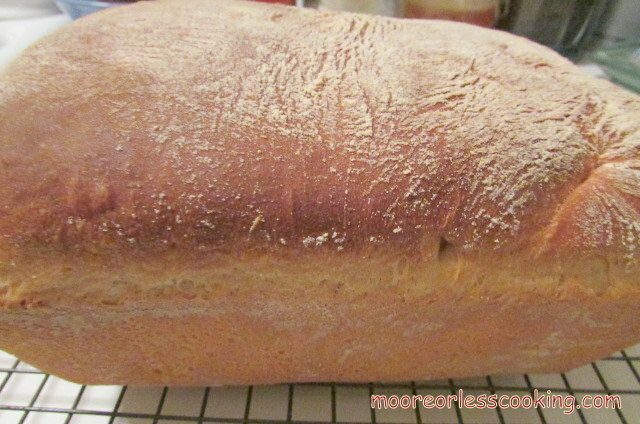 Baking bread makes the whole house smell wonderful! I can just imagine the wonderful aroma wafting through your house when this beautiful bread is baking! Gorgeous bread Nettie. I’d love a slice with butter and jelly! 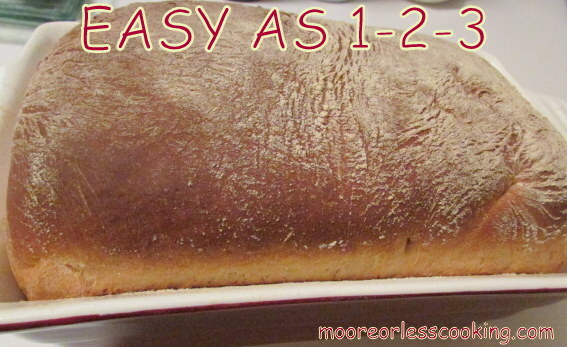 Such a gorgeous loaf of bread and I love that it’s easy! I love your instructions of handling the bread! I was picturing you slapping it on the table and twisting and punching it! Sounds like such fun and this bread looks so soft and delicious. I am going to give it a go! This is a good looking loaf of bread. Thank you Rebecca! I have been known to share a loaf with hubs! I love making homemade bread. The smell of yeast is intoxicating! 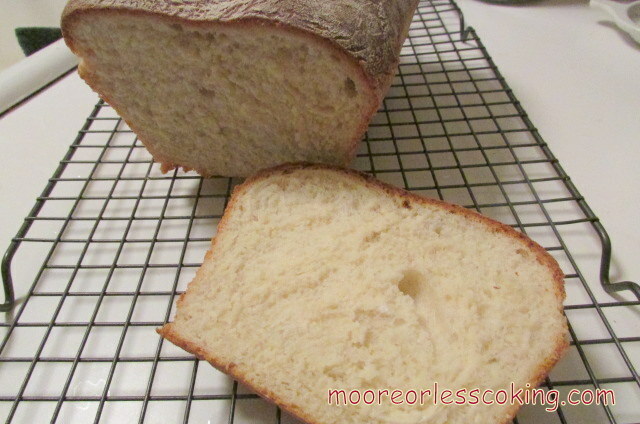 I love homemade bread, and yours looks great! I always make my own whenever we have soup for dinner. And, since it’s been cold lately, I’ve been making more of it. Looking forward to trying your recipe. I must admit Nettie, the only homemade bread I’ve ever made is in my bread machine. Your recipe sounds simple, even for me! It is so simple! Best recipe and so amazingly delicious Nancy! Ok Nettie, I’m going to try it. Making bread always seems so difficult but this looks do-able! Thanks for the recipe! Just give yourself time, for the dough to rise, but you will be so thrilled how this amazing bread turns out, beautiful and so delicious! I want to make homemade bread so bad~but I do not think yeast is my best friend.